Dhaka University IBA Admission Result 2015-2016 session. IBA, being one of the topmost departments of Dhaka University has recently published a circular demonstrating all relevant information related to DU IBA admission. According to the circular IBA admission test of Dhaka University will going to be held on November 20, this year. 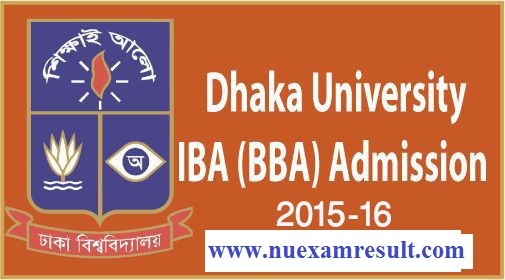 Get Dhaka University IBA BBA admission test result 2015. The admission test will be taken with a view to filling up the vacant seats of IBA 24th batch session 2015-2016. The pros and cons of DU IBA admission test and result has been uploaded in our sites so that interested people can go through. There are certain requirements for Bangla, English medium and foreign students. Bengali medium students who have passed SSC in 2010 to 2013 and HSC in 2015 are only qualified to attend for Dhaka University IBA admission test. Minimum GPA of 7.5 (SSC and HSC in total) is must to apply for the test. Students who have passed O level or IGCSE in minimum of 5 subjects in 2010 to 2013 and GCE/IAL A level exam minimum of 2 subjects will be considered as qualified for Dhaka University IBA BBA admission test this year. Most importantly, these students should get at least 4 B grades and 3 C grades in these exams. Overseas students who have a minimum score of 1900 in SAT Reasoning Test with minimum of 600 in Critical Reading and Mathematics and minimum of 550 in Writing can apply for the test. It is highly mentioned that no second time students are allowed to give IBA admission test of Dhaka University this year. Dhaka University IBA admission test result will be prepared on basis of the Written and VIVA exam. There will be several questions for the students which are focused to verify their knowledge in Language, Mathematics and Analytical ability. Each student has to pass in these sections individually to seat for the Communication Test. A good knowledge in English and Analytical Math is therefore a must to pass in DU IBA admission test. How to Get Dhaka University IBA BBA Admission Result?